WOW--763 entries!!! Thank you everyone for entering my giveaway and thank you I am a reader Not a Writer and Buried in Books for hosting this amazing giveaway!! Congratulations!! I will be emailing you in a moment or two and all you have to do is respond to my email within 48 hours with your name and address and I will mail you the $25 Barnes & Noble Gift card!! If by chance you don't respond--I will have to pick a different winner. 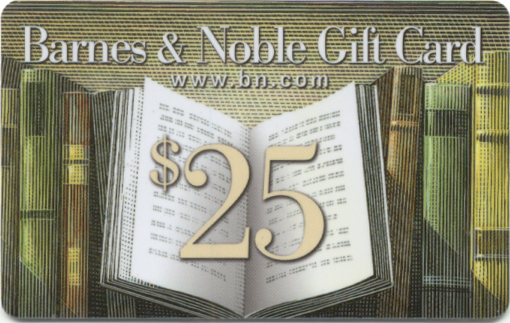 We are giving away a $25 Gift Card to Barnes & Noble Book Store!! This giveaway will end at midnight on 09/07. Winner will be announced here and notified via email. Mandatory entry must be completed first or bonus entries don't count. Please leave one comment per task you complete and leave your email address so you can be notified if you win. GFC follower under Lucky47. Thanks for thie awesome giveaway. I follow via GFC- Carly W.
+4 I subscribe to your email. I follow via twitter, username cshell202. You have a very cute blog here! I followed through GFC, using my Twitter account. I don't know if that counts as 1 entry or 2.
thank you for my favorite kind of giveaway!